War torn Baghdad might not seem the likeliest setting for mucking about on bikes. But a group of locals have defied the odds and are avoiding the police with their weekly meetings to practice stunts and race their motorcycles each Friday. Hundreds of petrol heads gather hours before the 3pm start, chosen as this is hailed the beginning of the weekend in Iraq. Most meetings are held under the Jadariya Bridge in the Jadariya district where the group, mostly made up of bikes and scooters but also some cars, are willing to risk getting moved on by the authorities in order to bring enjoyment back to their lives. The meetings started about a year ago and have become a weekly feature in the city. The ‘racing’ initially began back in 2005, but was stopped after several months as it was feared that those spectating could be killed by car bombs or bikers fitted with explosives. There is now another threat to the meetings though as soldiers are once again being told to stop bikers on large machines. 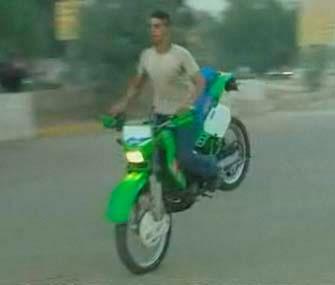 This act comes after a series of motorbike murders rocked Baghdad. It is thought motorcycles are being used to target officials from the Defence and Interior ministries and more than 1000 machines have been confiscated already.